Tower of Power - the most dynamic and distinctive band of survivors in Soul Music – is roaring into its unprecedented 50th anniversary with a dynamic album of all new material. A labor of love, definitively titled Soul Side of Town, this package is charged with 14 filler-free songs. 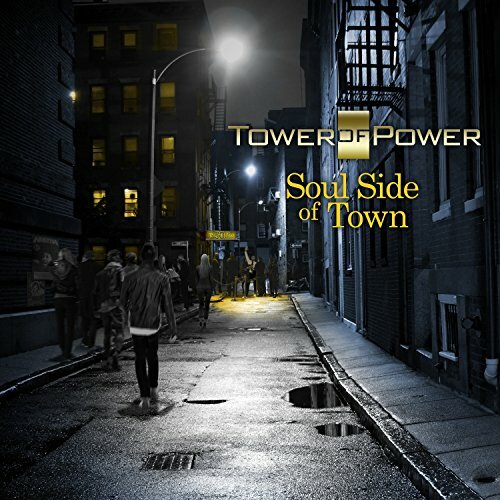 As always, the songs on Tower of Power’s Soul Side of Town were primarily composed by the hit-making team of founding members Emilio Castillo and Stephen “Doc” Kupka who also hold down the world famous 5-man Tower of Power Horns. For the special occasion of Tower of Power’s 50th anniversary, leader Emilio Castillo brought in a most-astute choice in co-producer, Joe Vannelli in addition to mastering engineer Bernie Grundman. Along with the legendary rhythm section drums and bass lock of David Garibaldi and Francis Rocco Prestia, respectively, T.O.P. consists of guitarist Jerry Cortez, Hammond B3 organist/keyboardist Roger Smith, 1st tenor saxophonist Tom Politzer, and trumpeters Adolfo Acosta and Sal Cracchiolo. Soul Side of Town is also blessed with not one but two lead singers: outgoing Ray Greene and incoming Marcus Scott (boldly introduced on several selections, including “Hangin' With My Baby”). The 10-piece Tower of Power band is prepared to throw down with a celebratory tour that will include sweet spots around the globe. If you have any questions about this product by ARJY9, contact us by completing and submitting the form below. If you are looking for a specif part number, please include it with your message.